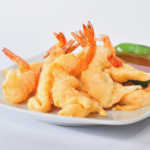 The Camaron Rebosado Recipe is a deep-fried battered shrimp dish in the Philippines. It is a Filipino style dish with a Chinese influence but has a Spanish name. It is a crispy batter coated shrimps that are similar to Japanese Tempura, although tempura uses a lighter batter. Shell and devein prawns, leaving tails on. Sprinkle with salt and lemon juice. Set aside. In a large bowl, sift flour, baking powder, salt, and pepper together. In another bowl, combine egg with cold water. Gradually add to the flour mixture, stirring to form a smooth paste. Put oil in a deep pan to a depth of 3 inches and heat to 375°F. Holding prawns by the tail, dip in a batter and deep fry a few pieces at a time 3-4 minutes or until golden brown. Serve with vinegar, sweet and sour sauce or ketchup. This video shows another recipe for Camaron Rebosado.